Here in Bermuda Remembrance Day, November 11, at the National War Memorial and Cenotaph on Front Street in the city of Hamilton, occurs annually. 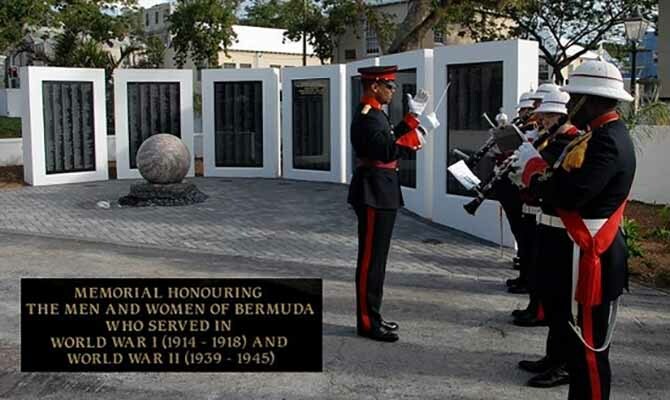 It is a solemn and sad Bermuda Public Holiday which honors and pays tribute to those who fought and fell as Bermudians and British subjects in units of the British Armed Forces during the 1914-1918 Great War (World War 1) conflict. They gave their lives in defense of freedom. On November 11, wreaths to honour the war Veterans dead of Bermuda are laid at the Memorials above by the Governor, Mr. George Fergusson, the Premier, The Hamilton Mayor , the Opposition Leader, followed by the president of the War Veterans’ Association, the Defence Board chairman, the Bermuda Regiment’s commanding officer, the Commissioner of Police and the Chief Fire Officer. 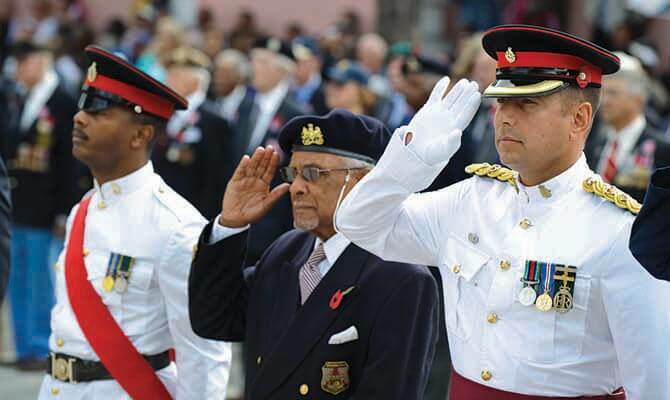 Parading along Front Street wearing their war medals are the ever-fewer remaining living war veterans of World War 2 well enough to attend, including former members or their representatives of the Bermuda Home Guard and Bermuda Contingent of the Caribbean Regiment. All relatives or descendants of a World War veterans are invited to take part. Participants are welcome to wear the medals or awards of the person they are representing. They wear the decorations on the right arm rather than the left. 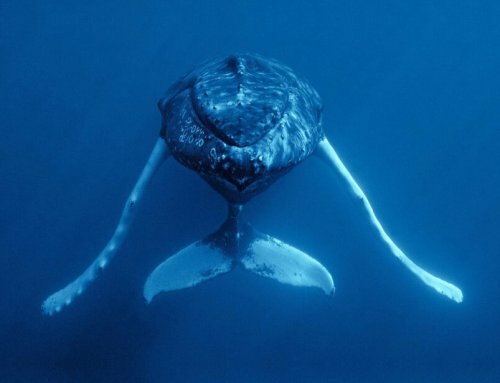 They are always watched by a large gathering of other residents and visitors and are accompanied by the Bermuda Regiment Band and Corps of Drums, the Salvation Army, North Village and Somerset Brigade Bands, and the Bermuda Islands Pipe Band. All join in singing hymns, and in participating in a two-minute silence on the 11th hour of the 11th day of the 11th month since the end of the First Word War. An additional parade takes place in St. George’s. At 11 am there is a dead silence observed by all present. It marks the 11th hour of the 11th day of the 11th month of 1918 when an Armistice was finally signed by the protagonists, after more than four years of fighting on the battlefields of Europe. Millions of soldiers were dead, dying or mutilated. They included many Bermudians, plus Americans, Australians, Canadians, New Zealanders and more. They died or survived while serving in the British Army or Royal Navy or Royal Flying Corps, later the Royal Air Force, after earlier basic training in the Bermuda Local Forces of the Bermuda Militia Artillery (1894 to 1965) or Bermuda Volunteer Rifle Corps (1894-1946), later Bermuda Rifles (1946-1965). On November 11, 1920, the first such Remembrance Day of veterans to honor their fallen comrades occurred at the then-newly-built Cenotaph in London, attended by Britain’s King George V. Since then it has been an annual tradition. In Bermuda, a copy of London’s Cenotaph was built on Front Street in the City of Hamilton and for years annual Remembrance Day parades were held there. More than 90 Bermudians died for Britain in the Great War. After the end of World War 2, Remembrance Day parades of veterans to honor their fallen comrades were resumed in Bermuda (and all other British Commonwealth Countries), to honor those who fell in both the Great War and World War 2. More than 35 Bermudian men died for Britain in World War 2. Bermuda veterans of World War 2 who died and lived were mostly in the Bermuda Home Guard or serving abroad in the British Army (Mostly Caribbean Regiment or Lincolnshire Regiment), Royal Navy, Royal Marines, Merchant Navy, Royal Air Force, Royal Canadian Air Force, Royal Canadian Navy and, as was the case of a few, the US Armed Forces. Also in the Second World War, 29 Bermudian women served overseas. 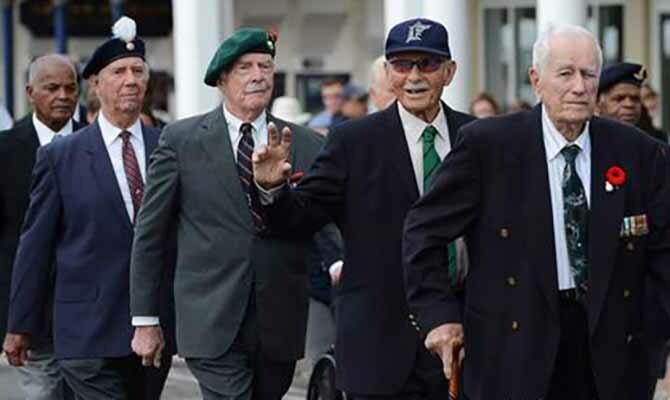 In Bermuda, as at November 11, 2008, there were 183 living registered veterans and 78 widows of veterans (but numbers have shrunk significantly since then). The Home Guard were joined by Bermudians working in Royal Naval Dockyard. The latter helped keep the Atlantic supply lines open, ensuring Bermudians, American, British and Canadian forces then stationed in Bermuda received essential supplies.